3 million Note7 smartphones were recalled last year by the company. Samsung Electronics on Monday blamed batteries supplied by two manufacturers for the overheating and even explosions of some Galaxy Note7 phones, as it tried to provide a long due explanation for the issues surrounding the smartphone. The announcement by the company, a day ahead of it reporting its fourth quarter results, had experts from TUV Rheinland, Exponent and UL stating that internal manufacturing and design defects of the batteries, including missing insulating tape in some cases, and not the design of the phones were responsible for the battery issues. The negative electrode windings in the battery of an unnamed “manufacturer A,” who first supplied the batteries for the Note7 phones, were found in some cases to be damaged and bent over because the cell pouch did not provide enough volume to accommodate the battery assembly, said Kevin White, Exponent’s principal scientist, at a press conference that was webcast. There were signs of internal short circuit at different locations of the cells from five of the damaged devices, said Sajeev Jesudas, president of the consumer business unit of UL. He also pointed to deformation of the upper corners of the batteries, missing insulation tapes on the tabs, and the use of thin separators as some of the factors that could contribute to a short circuit. After incidents were reported on the field, Samsung turned to another supplier, referred to by the company as “manufacturer B.” But welding defects in “some incident cells were found to be tall enough to bridge the distance to the negative electrode foil,” raising the possibility of short circuits and self-heating, White said. Samsung turned to Amperex Technology in Hong Kong to supply batteries for the replacement Note7 phones after issues were reported with batteries supplied by affiliate Samsung SDI, the Wall Street Journal reported, citing people familiar with the matter. Samsung’s team of investigators checked the Note7’s features such as fast charging, water resistance and its newly-introduced iris scanner for a possible role in the explosions but found those had not had an impact, said D.J. Koh, president of the Mobile Communications Business at Samsung. More than 700 Samsung researchers and engineers tested over months over 200,000 Note7 phones and 30,000 phone batteries before arriving at their conclusions, he said. In the wake of reports of overheating of the lithium-ion batteries, Samsung announced a global recall of the Note7 in early September after it found a “battery cell issue.” The U.S. Consumer Product Safety Commission also announced on Sept. 15 a recall in the U.S. of about 1 million Note7 phones. The replacement phones Samsung shipped out also had battery issues leading the company to recall the phones again and end production of the device. By Oct. 13, CPSC had expanded the recall to include replacement Note7 phones that Samsung had supplied to customers under the first recall program. Samsung said that 96 percent of about 3 million Galaxy Note7 phones “sold and activated” had been returned by users. As some customers had not returned the phones to the company, despite an offer of an exchange with other Samsung devices or a refund, it had to take recourse to working with cellular operators in some markets like the U.S. and Australia, to disconnect the phones from the network. 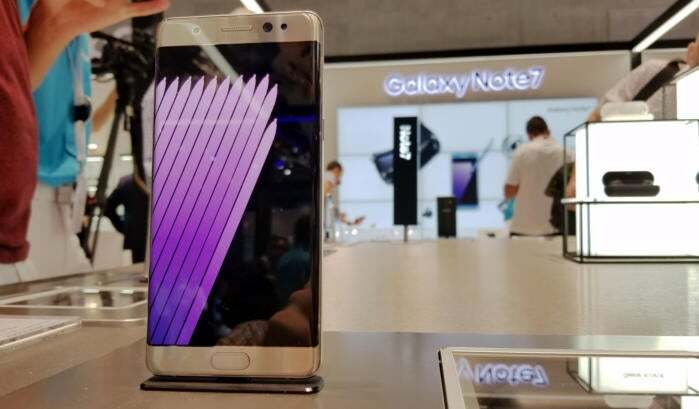 The Note7 recall was a public-relations and financial debacle for Samsung, which reported that the third quarter revenue of its IT and Mobile Communications division was down 15 percent from the same period last year to 22.5 trillion Korean won (US$19.8 billion) while operating profit fell 95 percent to 100 billion won, as a result of the discontinuation of the Note7. The company now expects a turnaround in the fourth quarter, largely because of a better showing by its components business that includes memory chips and displays. In guidance issued earlier this month, the company said its profit has grown year-on-year by close to 50 percent in the quarter. Revenue for the quarter is expected to be about the same as in the fourth quarter of the previous year. Samsung is trying to put the Note7 debacle behind it and may well succeed. “Most in the US and Europe had forgotten about it already. It’s China they really need to lean into and make sure this message sticks,” said Patrick Moorhead, president and principal analyst at Moor Insights & Strategy. 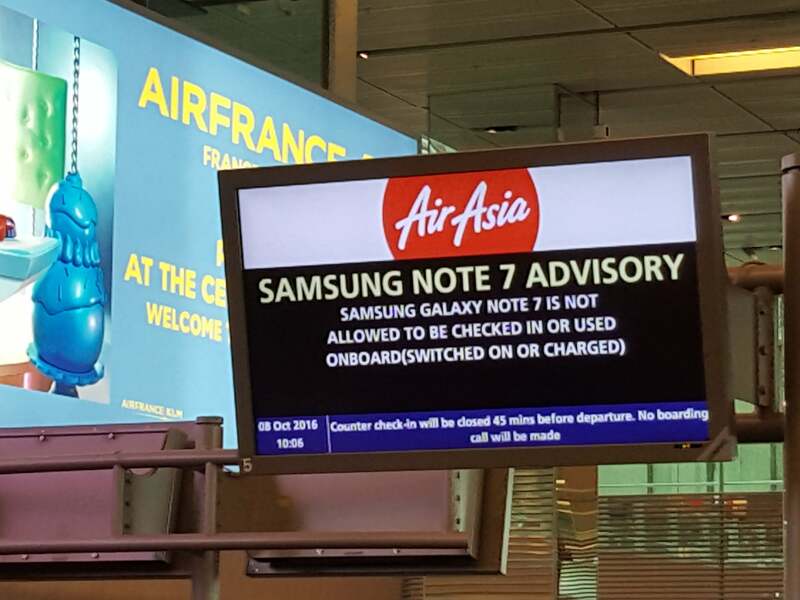 A sign advises against use of Samsung's Note 7 in aircraft at Changi Airport in Singapore on Oct. 8, 2016. To reassure customers, Samsung also discussed steps it was taking to ensure product quality at every level of product development, including an eight-point safety check for batteries. Teams will focus, for example, on key components and work with external advisers to make preventative checks for any issues. A battery advisory group of external advisers made up of academic and research experts is expected to provide the company a “clear and objective perspective on battery safety and innovation.” The company is also introducing improved algorithms for managing battery charging temperature, and charging current and duration. The future will be even more challenging as consumers are demanding thinner devices that have longer battery life, he added. In the short term though there could be concerns from consumers about lithium-ion batteries after Samsung disclosed that two manufacturers had made serious mistakes. “This level of promotion will give some pause for a while as it relates to Li-ion devices, but as with most recalls, it will be forgotten in six months,” Moorhead said in an email.